Simon's latest audio adventure takes him to Mars, where you get to meet the incredible Mars rover Curiosity. This hard working robot has been sending back invaluable scientific data and photos since 2012. NASA only expected it to last two years maximum in the harsh Mars environment, but as of January 2018, it's still going strong. Not a bad effort on a planet famous for having no atmosphere to speak of, huge amounts of radiation, plenty of serious dust storms and mostly freezing conditions. On the day I typed this, the weather report for Mars was a Maximum of -22°C and a minimum of -78°C. There is of course a Mars Weather report Website you can visit. Naturally the best website of all is the NASA one. Everything you always wanted to know about Curiosity is here in one place, and of course, it's my number one source for all Mars related facts. You can send Curiosity a postcard from here. You can follow Curiosity on Facebook here. You can also download a drawing of Curiosity to colour here. 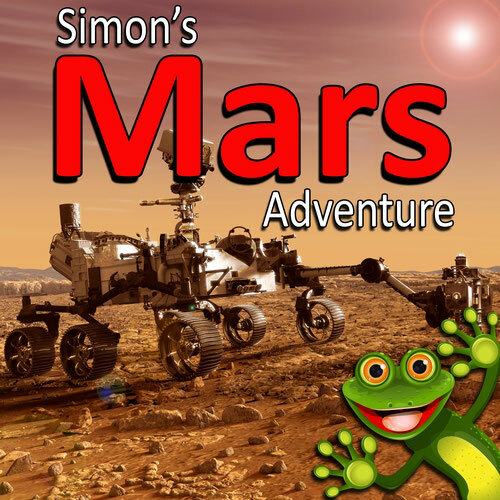 When your kids listen to Simon's latest Mars Adventure they won't just be entertained, they'll be learning too! It took over 8 months travelling across 570 million kilometers of empty space to get to Mars, but since she arrived in 2012, Curiosity has only travelled 18 Kilometres. The program to land Curiosity on Mars cost 2.5 billion dollars, yes that's billion with a B! Curiosity is powered by a nuclear energy power generator, which converts the heat generated by the radioactive decay of plutonium-238 into electricity. You have to admit that does sound very cool! Curiosity is packed with all kinds of amazing science equipment like - 17 cameras, a weather station, an onboard chemistry lab and a radiation detector. She also has a robotic arm with a power drill, and a laser that can vapourize rocks from 6 metres away. After one year on the Martian surface Curiosity played Happy birthday to herself. You can listen to to exactly what that would sound like here. It only happened once though and the explanation of why, which you can read here, is facinating!